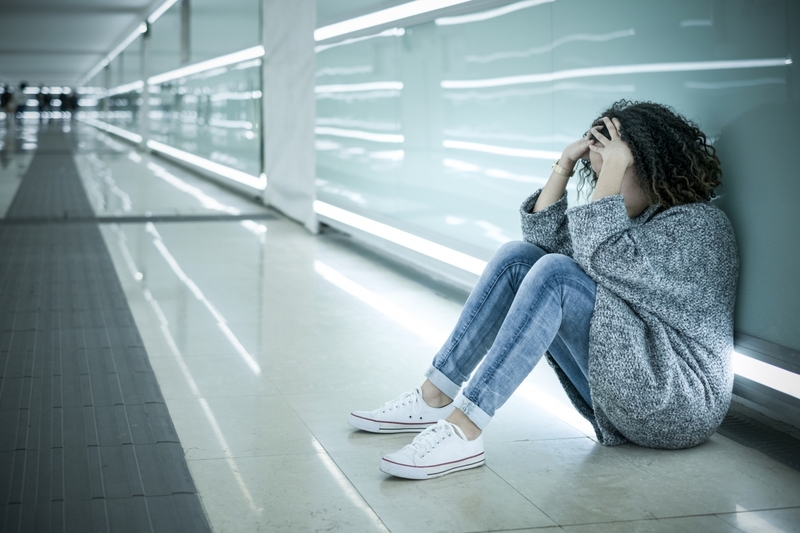 Nearly half of all teenagers investigated for neglect by Ontario’s child welfare agencies and exhibiting signs of aggression experience a separation from their family. This is because the parents are not willing or able to remain their caregivers. 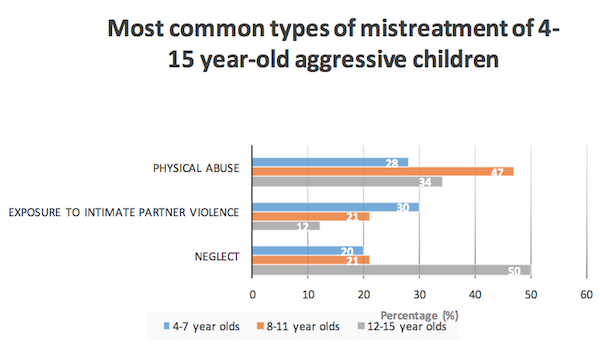 This startling finding comes from one of the first large-scale studies of Canadian data on maltreatment and aggressive behaviour in children and youth. The results have implications for North America as a whole. The research team also found that, in addition to suffering from various kinds of maltreatment, the vast majority of children and youth who are aggressive have non-behavioural problems ranging from educational difficulties to anxiety and ADHD to deal with (the figures that range from between 86-96 per cent, depending on the age group). The study, which was recently published in the Journal of Child Abuse and Neglect, is based on almost 2,000 substantiated investigations of maltreatment in Ontario that were conducted during three months in 2013. The research team, which brought together scholars from McGill University and the University of Toronto, estimates that for the whole year of 2013 the number of substantiated cases of abuse and neglect of children aged zero to 15 years, from all agencies in Ontario, would amount to just over 43,000 children. But not all of these abused children become aggressive. The researchers wanted to unpack the details of child and youth mistreatment to get a better picture of what factors can play into children developing aggressive behaviour, so they looked at different forms of abuse, along with its frequency and severity, as well as at a number of other problems that the children and youth might have including school difficulties and emotional and developmental problems. 13% of maltreated youth and children served by the Ontario child welfare system exhibited aggression. These rates of aggression are significantly higher than in the general population of Canadian children, which have been previously been estimated to be somewhere between approximately 1-4%. But it was when they looked at the details of the types of abuse and the children’s ages, that the picture became more complex and, in some ways, more surprising. 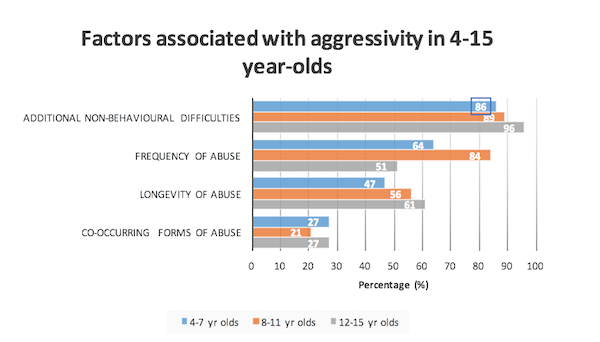 The chart below provides details of the types of abuse that children who are aggressive have most commonly experienced, broken down by age group. The research showed that it was not simply the type of abuse, but the frequency, persistence, as well as co-occurring forms of abuse that had the highest correlations with aggressive behaviour. But most striking, was the fact that the vast majority of aggressive children also had non-behavioural challenges to deal with. “We often think of aggressive kids as having single needs, but what we can see clearly from this research is that they usually have a whole host of other issues to deal with, often related to mental health and educational difficulties,” says Nico Trocmé, from the Center for Research on Children and Families at McGill University and one of the coauthors on the paper. The researchers gathered information about different kinds of abuse as detailed by 17 child welfare agencies across the province of Ontario in the Ontario Incidence Study of Reported Child Abuse and Neglect for 2013. This abuse included physical abuse, sexual abuse, neglect, emotional maltreatment, and exposure to intimate partner violence. They also looked at the range, severity, chronicity, and frequency of the abuse, and then correlated this information with other factors apart from maltreatment that might contribute to a child’s difficulties, such as family poverty, parental mental health issues, child intellectual and/or developmental disabilities, among others. This research was supported by the Social Sciences and Research Council of Canada and the Ontario Graduate Scholarship.